Whenever I see a jar of artichoke hearts it makes me sad to think of all the delicious leaves left behind. We serve this as a first course or side, but they can easily be substituted as a main course if someone is so inclined. The recipe’s below, but first I wanted to mention that Alison over at Happy Domesticity (love that name) recently awarded me a Versatile Blogger Award which she’d been given by The Baker’s Laboratory, who I’d given it to. (It’s sort of a pay-it-forward thing.) Here’s Alison’s list and here’s one I wrote when Cadencies was nice enough to award it to me a bit earlier. So go check out their blogs, but first buy some artichokes. Cut ¼” off the tops of artichokes and trim all the points off the leaves. Cut bottom stem so each artichoke can sit upright. Fill a pot large enough to hold the artichokes in one layer with water. Squeeze lemon in and add halves to water as well. Bring to a boil and cook on medium until a knife can pass through the base of each artichoke, about 20 minutes. Meanwhile mix breadcrumbs, cheese and parsley. Add wine until mixture resembles course crumbs that barely stick together. Remove artichokes from water and let cool. Working from the outside in spread each ring of leaves and stuff with breadcrumbs. Continue until all are done. Drizzle with olive oil and put in a baking dish. Bake at 365 degrees until done about 25 minutes. To eat, take a leaf and scrape the stuffing along with the soft flesh off with your teeth. Once all the leaves are pulled off, remove the choke (hairy part) and enjoy the heart at the end. This entry was posted in Food, Recipes, Sides and tagged artichoke, food, Recipes, side dishes, vegetarian, versatile blogger. Bookmark the permalink. You have no idea how excited this recipe made me! I have always wanted to try these but was lost as to how to go about it! Now I have your recipe and when we move and can get hold of an artichoke I am so making this! Seriously, these things always scared me, as they seemed so “foodie”. Thank you! I saw your comments on most of the blogs I read, I guess we have a common blog reading pattern. Glad discover your blog! I like your posts. OMGoodness! That looks so delish! My family is not fond of artichokes. Maybe this recipe will change their minds. I love this recipe! I grew up eating artichokes in this manner. Canned and frozen artichokes have the place in many recipes, but to me the act and art of pulling the leaves, scraping off all the goodness is foodie pleasure at its best! The wife here weighing in. I just wanted to say I didn’t quite trim those top leaves as well as I should have. We served these on our anniversary and I took off that day and did some of the prep work for dinner before my husband came home. The top should be a bit more blunt! 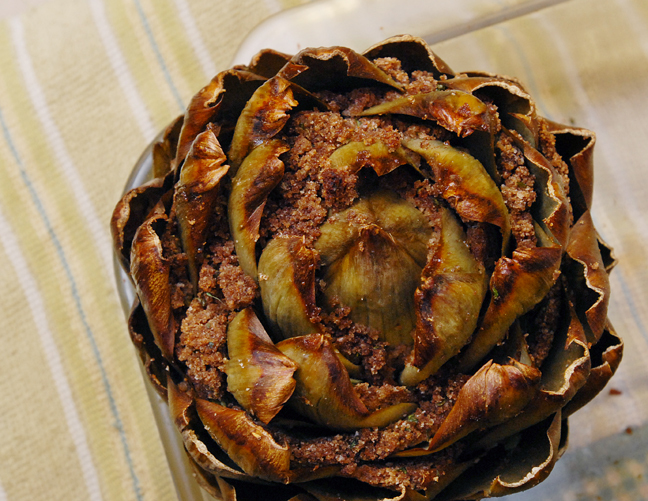 Great recipe for artichokes. My girls absolutely love them. I will have to make this. Have a great Easter! I’ve never eaten artichokes in this way but I think I may give it a try. Why not, I need to try something new every month and this is it. This looks so tasty! I must give this a try! I love stuffed artichokes! We always order them at one of our favorite Italian restaurants and we used to make them at home. We’ve never baked them in the oven though. We’re going to have to give this recipe a try! Yum! Artichokes are my favorite! Oh wow, this looks absolutely spectacular. Nothing I don’t like in this recipe! artichokes are a favorite of mine. Like the blog, and have added you to my reader. Happy fooding. Artichokes rock! I am definitely marking this recipe for later. Thanks for the post! I LOVE stuffed Artichokes. They remind me so much of the holidays since that is the only time that I get to eat them. The one thing I don’t make enough of is artichokes. I think, after seeing this recipe, I am going to have to make some soon! Sounds so good. Wow. Those look delicious! I can’t wait to give this recipe a try. I love a good stuffed artichoke! This looks like a great recipe. And, congrats on the award! It’s well-deserved! This recipe looks incredible. I need to find out when artichokes are in season in the UK! I used to have the leaves deep fried which is so unhealthy but very yum. This looks much, much better! I agree – they can be a whole meal. I’ve made these quite a few times but I like to steam them instead of boiling. Other than that, pretty much the same. cheers! I’ve had artichokes plenty of times in dishes, but have never, ever cooked with them, let alone the whole shebang! Not sure why that is…this sounds tasty, though. Hurah! In other springtime-inspired produce purchases, my husband grabbed two artichokes. I love artichokes but I still have not gotten comfortable with the whittling and cleaning them down process, and hadn’t decided on their fate. I can cut this recipe in half and eat it tonight along with that crispy roast potatoes recipe featured on smitten kitchen the other day. Sounds like a great meal! Had this for dinner Sunday night. Boiled the artichokes in the morning, finished for dinner. No problems breaking it up this way. Surprisingly filling, and very nice meal with some of my CSA Grass-Fed Steak and potatoes! Glad you liked them, thanks for reporting back!